I find the 11k estimate for the West Island branch to be pretty low. There’s already that number of people taking the 470 bus to Cote-Vertu, I have to imagine a faster and more comfortable route downtown would attract many of those riders and a lot of the new residents from the condo projects up and down the major boulevards. Right? it’s the first thing I noticed. The math here does a good job showing that 11k really is the right number in their studies, but I can’t understand how. If I put myself in the mind of the STM network planners, the first reaction to this line would be to reorient the west island network around the REM. Especially with the confirmation that the Fairview station will move to be right next to the new station there. I would expect that the express buses that travel down the 20 and 40 will be vastly reduced during rush hour, and a significant increase in frequency of the lines that head towards the new stations. That alone would provide tens of thousands of rides, and does not include the potentially huge induced demand of these stations, both in terms of mode switch of commuters heading downtown but also shifting local mobility with shorter trips. Regardless, great job deconstructing this, I really like the focus on the privatization of state assets and shifting costs. The province and feds are paying for just under half this project, yet the caisse claims it will totally own the whole thing. How does that work? @Faiz: Well, you know my view of terminal and spoke systems around highway based stations. The more time you spent on the feeder, the less effective the system will be. But in any case, most of the ridership on the West Island branch, even if it turns out to be much higher than this initial estimate, will come from Fairview — and most of the cost estimate is due to the almost 8km after Fairview. 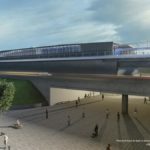 The branch would probably make much more financial sense simply terminating at Fairview; and would cause much less concerns regarding sprawl and developing green spaces. For sure. IMO extending to Fairview is almost as justified as the south short branch. After that its more suspect. If I had to guess, I would speculate that the extension after that is for two reasons. The St anne station is designed as a huge park and ride just like Rive-sud. If they didn’t have that they would saturate Fairview and the surrounding roads with parking and congestion more than it already is. This way they shift the cars off and may be able to develop in the fairview area with less waste. Especially with the Kirkland station being as poorly palced as it is, have you paid attention to it’s location? its the worst of them all! Anyways, the second reason is a political move to make this plan palatable to a lot more people. Even with the line going to St Anne, we quickly heard complaints from leaders in Veaudreuil and St-Lazare about it not extending off the island the same was it goes to deux montagne. If they stopped at Fairview the complaints would be much louder and may have interfered with making it happen. Also the marginal cost of extending beyond fairview are not that much more. It’s a very straightforward route that will be trivial to build. Which is probably why the cost benefit calculation stopped it there. Actually, in the model I’ve built, most of the cost of the West Island branch is _after_ Fairview. This is because the 8km or so from the Deux-Montagnes line to Fairview include 7km along the existing doney spur right of way on ground level. The line still has to be completely rebuilt, tracks replaced, electrification added, and grade crossings removed. But overall it’s not too expensive. After Fairview, it’s an elevated line for 8km, because there’s no space to run it on ground level along the A-40. Maybe the cost assumption is a bit simple, but to me it appears that’s where most of the cost of that branch is. 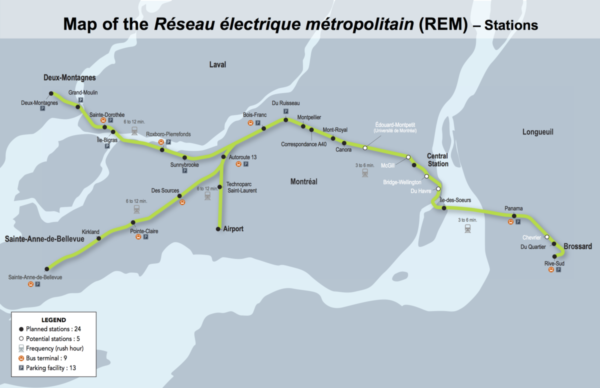 As in, for the cost of that branch after Fairview, it would make more sense to upgrade the Vaudreuil-Hudson line as much as possible. If the line terminated at Fairview, it would also compete much less with the Vaudreuil-Hudson line. Excellent effort Anton and basic reason arguments concerning the Caisse de Dépôt half baked (data to be fully baked next autumn, maybe) presentation. 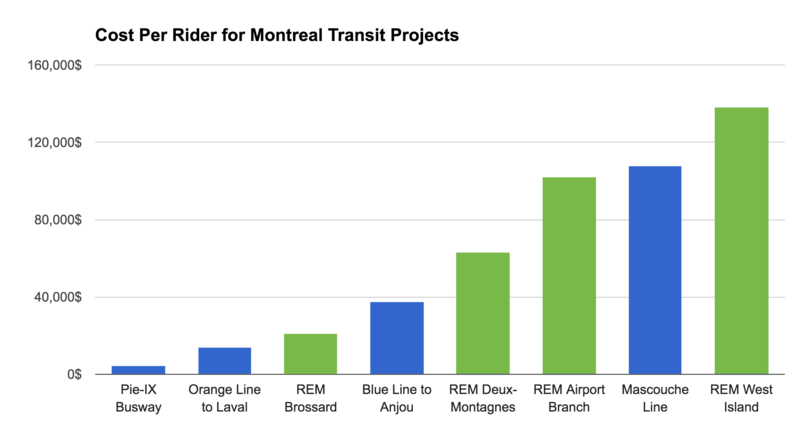 How come the blue line extension would cost 500million$ per km, according to the troubled Transport Quebec ministry experts and ‘’only’’ 200m$/km for the Caisse ? For Laval, with corruption and going under the Riviere des Prairies was 150M$/km ! What does our society need? Some ”profitable” lines and agricultural land conversion to buildings and free loading parking at the terminals or an efficient Quebec? Further scattering the Montreal population, with already 5 times less density than Paris is against any environmental objective. Adding this recurrent environmental cost to the present 1 hour time, minimum, to the disastrous present congestion in the A40 between Lacordaire and Decarie section of the A40, that will be left untouched, would have killed the Caisse de Dépôt idea, if it had any reasonable chance to be acceptable. A blue line extension from the airport to the east of A25 in Anjou is what we need, since in the morning a huge amount of people working in the industry close to the airport congests it in the east to west direction, the evening is the mirror image. Wasting 100 minutes to get to work ( STM info time) is much worse than the 60 min time for only 4% of the Germans. In ancient greek, somebody who was looking at his own interests only and not that of the city was called ‘’idiotis’’. The word is very similar in the modern english and so is the meaning. The penalty in those days was exile. 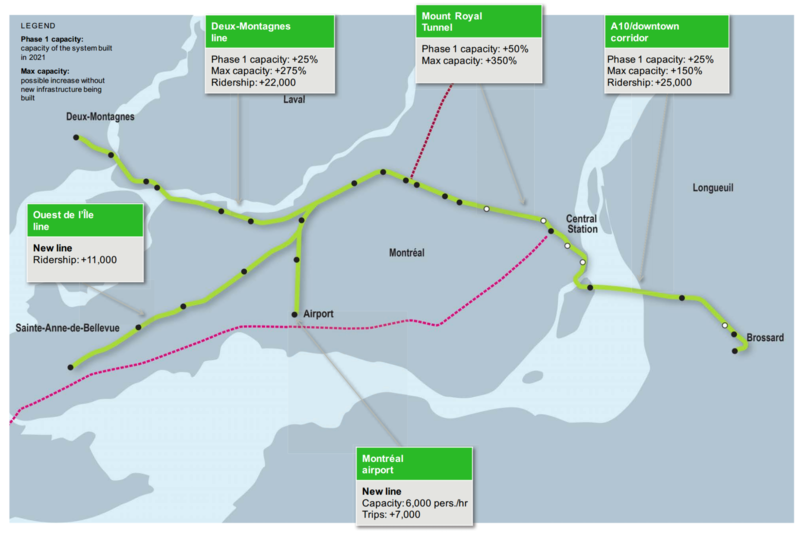 I think the 500M are because they’re planning a bored tunnel, while most of the caisse is cut-and-dover. The tunnels are also along developed areas, under houses, so the construction is more complicated and there may be infrastructure relocation issues, and there may be more property acquisition cost issues. Finally, the 200M is just for the tunnels, without any stations. The Blue Line extension includes 5 full size underground stations, which again are very expensive, and again require a lot of infrastructure relocation, real estate acquisitions etc. 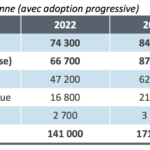 Finally, if I chose a much higher number than 200M per km for the Caisse’s project, then I’d have to dial down the costs of everything else much more in order to make it sum up to 5.5 billion, and that seems less realistic. Awesome read! Keep up the good work.